The project that you all are tired of hearing about is finally finished and is now in the hands of the recipient, my mom. Here are some final pictures, as taken in my back seat before mailing it (the challenges of borrowing a digital camera for blogging purposes!). Here is a snapshot of it all sewn together and spread out as much as possible in my back seat. The dyelot differences are not as noticeable in person as they are in these photos. The edging gave me the most problems out of the entire project. I knit the whole edging separate from the afghan, as called for in the pattern. When I went to attach it to the afghan, it was too big. There was no amount of fudging the seaming that would make it work. So, I frogged it and re-did the entire edging attached to the afghan. 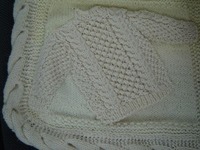 The final square completed was this cute little sweater square. I finished the whole thing and realized that I hadn’t made the sweater for this square yet. This also shows the corner edging. My mom called on Sunday to tell me she received it. She said it is like snuggling up in one giant sweater, so that made me happy. Overall, the squares were fun and challenged me. I wish I would have finished it more quickly, but it was worth all of the time I put into it. The only things I would do differently would be to buy all of the yarn at once to avoid dyelot problems (boy did I learn that lesson) and to do the edging attached to begin with. I’m glad that I’m pleased with the results because I don’t have any plans to make another one any time soon! Wow – it is beautiful. I am sure your mom will treasure it and enjoy showing it off to her friends. Wow Sarah!! It looks fabulous. I love that little sweater square. 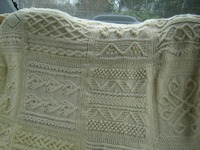 I would’ve needed a lot of wine to reknit the edging! Sarah it is stunning. What amazing craftmanship you put into it. Wow…what a labor of love!! It is so gorgeous. Great job! That is superfantastically beautiful! Your mom is lucky to have you and your knitting skills! This afghan is lovely! I stumbled upon your FO gallery and just wanted to tell you how great it is to see such a young person already so accomplished in her knitting. Your work is all beautiful! Wow, Sarah, it’s SO awesome. Congrats on finishing! Wow, wow. It’s amazing. Your mom will think of you every time she wraps up in it. What a wonderful gift! Oh WOW! That is a beautiful afghan! 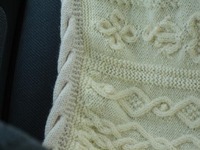 I don’t think I would have had the patience to reknit the border, but it really looks great. Beautiful! This blanket is on my “eventually” list, congratulations on finishing it! !